Livinroof is a replacement conservatory roof system that is tiled and glass. Enjoy a warm and light filled home when you choose this hybrid system from Ultraframe. Contact us for details. Instead of having to select a glass or solid conservatory roof for your home in Kenilworth, Leamington Spa or Warwickshire, you can enjoy the benefits of both with an Ultraframe Livinroof. The Livinroof is a replacement solid conservatory roof system that will provide you with the range of design choices you need to make your home expansion project a success. It is also an ideal choice if you’re planning a house extension. The Livinroof roofing system enables you to combine solid and glazed roofing seamlessly. Extending your living space and providing excellent thermal performance, a Livinroof can be configured to upgrade virtually any existing conservatory roof and gives you that perfect room to use and enjoy all year round. Whether you are building a new home extension, or upgrading and replacing your existing conservatory roof, a Livinroof gives you total design flexibility. Allowing you to choose exactly how much and where you would like the areas of glass to be positioned, a solid conservatory roof enables you to create a unique, beautiful and thermally efficient room. The Ultraframe Livinroof installed by Fox Windows and Doors will reward you with a light, warm and comfortable new room space to spend time in. There is nothing quite like this hybrid system available from any other manufacturer. Keeping warm during those colder autumn and winter months is easy with Livinroof. Internally, an insulated pelmet adds an authentic real room touch, while keeping your new space warm. Your new installation could deliver a U-value of 0.16, which means your home in Kenilworth will be cost effective to run. What makes the Livinroof so appealing is its flexible design. The glass panels in your replacement conservatory roof can be shaped however you like - allowing you to focus the light wherever it’s needed. Create a bright and spacious feeling new room that will feel like a natural extension of your home with Livinroof. The Ultraframe Livinroof is designed to work with almost any building style. It can be used in conjunction with many popular conservatory styles, including Victorian, Georgian, Lean-To and P-shape. You won’t have to compromise when you ask Fox Windows to install your new solid conservatory roof. Achieve a modern and impactful design with super-insulated columns, which offer thermal efficiency levels 5 times greater than a brick pier of the same size. Depending on whether you want to achieve a modern or traditional design, you can ask us to install plain or fluted columns to meet your design requirements. The safety of our customers matters to us. We chose Livinroof because it has been tested independently - and as a complete structure - by Warrington Fire. All requirements were met to achieve the necessary fire ratings - so you’ll be able to buy your solid conservatory roof with total peace of mind. Livinroof is lighter than any other solid conservatory roof. Weighing in at just 36kg/m², it will place minimal stress on your frames and foundations - which means it will be compliant with planning and building regulations. It is also extremely easy to manoeuvre on site, reducing time spent on site. Livinroof blends in with any home – regardless of its size, shape or age. The neutral contemporary grey shade of your new solid conservatory roof will ensure it blends in with its surroundings without jarring. Ask the Fox Windows & Doors team about the other design options available with this stunning system when contacting us. You’ll also be able to hide your roofline by asking us to add a decorative cornice to your solid conservatory roof. Almost any colour can be used to ensure your updated conservatory or house extension makes the right impact. The decorative cornice works with almost any of Ultraframe’s roof systems. 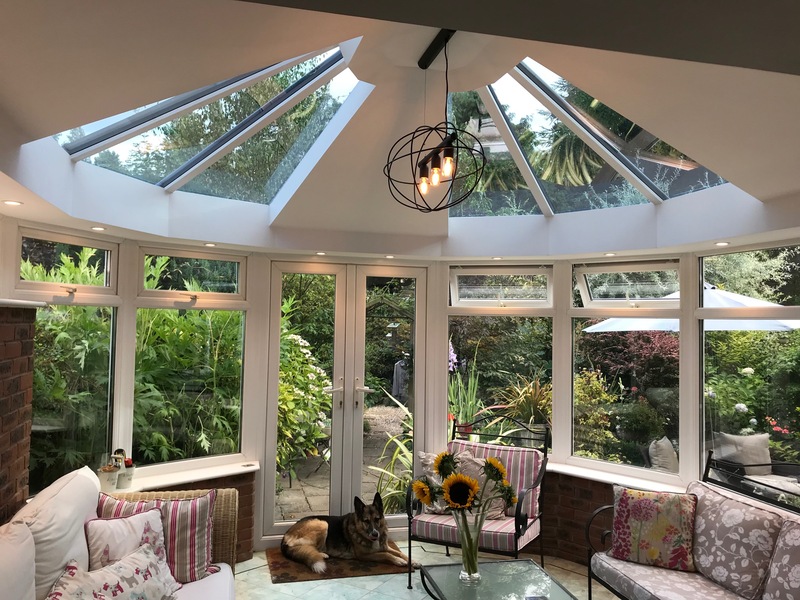 The glazing used in your solid conservatory roof will block almost all solar rays, so that your new room remains cool during spring and summer. The technology used in your replacement conservatory roof’s glass will also stop cold air entering. You’ll be able to enjoy a space that can be used for relaxing or entertaining at any time of the year. Your newly-fitted solid conservatory roof from Fox Windows & Doors will come with a genuine manufacturer’s warranty. We’re registered Ultra Installers, a scheme used by Ultraframe to assess its installer. The assessment process has been approved by Which? Trusted Traders, so you can talk to us about your requirements with confidence. Take the virtual reality tour to learn more and use our design tool to build your replacement roof online. Get a quote today. Contact the Fox Windows & Doors team for helpful advice and a solid conservatory roof quote. We cover Kenilworth, Leamington Spa, Warwickshire, Stratford Upon Avon and the nearby areas. If you just want costs for now, please visit our free design tool. You can build your solid roof conservatory online quickly and get instant prices. Why not use our new virtual reality tool to take a tour of your preferred roof!